A not-so-great way to start off your day is waking up to learn that you have no hot water. Or even worse, you go to the basement to discover that there are 40-gallons of water covering your floor from the water heater tank springing a leak the night before. If this hasn’t already happened to you, the best way to guard yourself against a panic-stricken nightmare is to be prepared. If you have a Water Heater issue arise, Plumbing 911 will be there for you to service your needs immediately. As a family-owned and operated business we care for our customers and their home as if it were our own home. We take pride in the services and the quality materials/ equipment we use to get the job done right and promise no delay when it comes to providing your home with hot water. 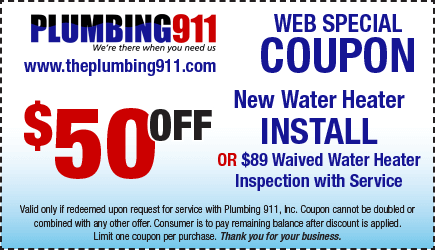 Plumbing 911 offers service to existing water heaters as well as new water heater installations to maintain your home’s hot water supply. Water Heater Warranty Numbers (make sure to have your serial number and model number when making a warranty claim for your tank’s manufacturer).